Sadly, cycling can be very dangerous – especially for women – so Shiny Shiny has brought together a selection of products which are of high quality as well as prioritising safety where possible. Here, I’ve tried and tested bright, beautiful clothing designed to make your cycle more comfortable, as well as more aesthetic. Check out part two of this round-up, coming soon, for accessories and gadgets! This tank top is great for hotter days and comes in a brilliant sky blue. 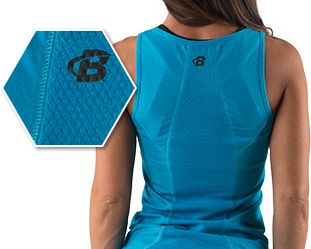 It fits in a casual yet flattering way, and is specially designed to be stretchy and comfortable during a workout – or indeed, a cycle ride – and keeps you cool with a mesh panel down the back. Since wearing this, the commute to work is definitely more breezy – and much less sweaty! B-Elite Breeze Tank is available to buy online at uk.bodybuilding.com. Contrary to running, wearing a sport-specific bra might not be the first thing you think of when cycling. But the right undergarment is an important basis for a smooth ride – especially if your journey is riddled with potholes – and can make you more comfortable in the long term, too. Enter online retailer Bras and Honey. Among its huge collection of lingerie and swimwear, there are some fantastic sports bras which provide comfort and a lot of support. While it specialises in lingerie for larger-busted ladies, there’s a broad selection for everyone, and I tried out the ‘Shock Absorber’ maximum support sports bra with very pleasing results. The Shock Absorber bra fit tightly, making me feel supported without being uncomfortable, and made my cycle noticeably more comfortable every morning. I particularly like it because it has adjustable straps and a clasp at the back, so you don’t have to put it on over your head. Bras and Honey Shock Absorber maximum support sports bra is available to buy online at brasandhoney.com. These socks are absolutely perfect for the heat of summer – your feet noticeably sweat less, and they feel cushioned and light underfoot. The socks dry off impressively fast and your feet aren’t left with the usual damp feeling. Made from recycled and reprocessed fishing nets, the Evapor8 socks are environmentally-friendly and include “strategically placed forefoot and heel cushioning, anatomical heel pockets and seamless toes for a blister-free experience”. Evapor8 Ultra Light Socks are available to buy at www.tekoforlife.co.uk. These beautiful shoes by Nike are water resistant and ideal for outdoor activity, especially cycling. They come in four great colour combinations, although the blues are especially summery. They’re very comfortable, light and attractive; not only have I had compliments when wearing them, but I’ve found the grip genuinely makes pedalling easier. Especially as I stop at traffic lights on a regular basis, balancing the bike with my toes, I find it very important to have adequate foot support – and the sole of these trainers is much thicker and more substantial than many of my other shoes. 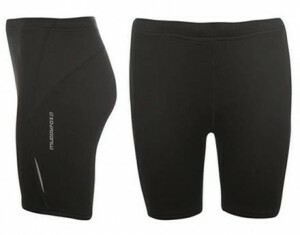 Fusing style with a comfort, these are a great addition to any summer cycling excursion. 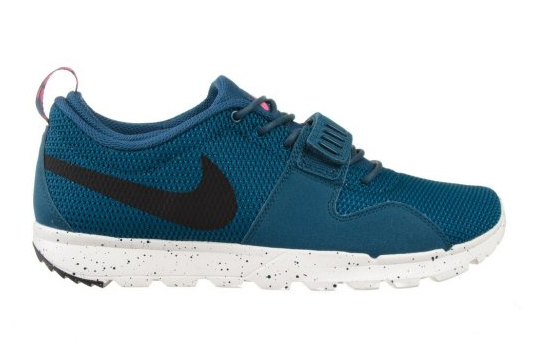 Nike SB Trainerendor Shoes are available to buy online at fatbuddhastore.co.uk. These great value cycle shorts have become a firm favourite of mine. The fabric is nice and thick, making them comfortable for everyday use; they also have rubber grips around the thighs and reflective strips, which is an added bonus in a city like London, where cycling can be dangerous. And best of all, they’re entirely affordable – just £5.99 a pair. Muddyfox cycle shorts are available to buy at Swimshop.co.uk. Interesting article Sadie. Very informative. For me it’s very hard to choose the right sports bra . Much harder than choosing a right pair of trainers ’cause it all depends on type of activity that I want to do.